Melissa Joan Hart explained it all-from dating to bullies-in her groundbreaking role as Clarissa Darling on Clarissa Explains It All. She cast a spell on millions more viewers as Sabrina, the Teenage Witch. Now, in Melissa Explains It All, Melissa tells the frank and funny behind-the-scenes stories from her extraordinary past and her refreshingly normal present. Melissa has been entertaining audiences most of her life; when there were no girls named Melissa on her favorite show, the forceful four year old decided she'd get on television her way. From that moment on, Melissa has shown a singular determination and focus-whether it's for booking three national commercials so her dad would build her a tree house or for nailing the audition for Clarissa. 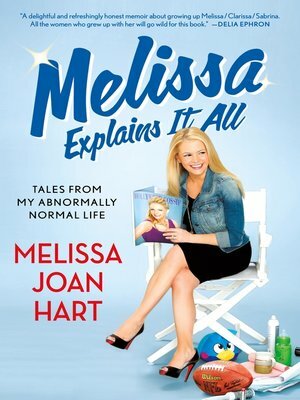 Melissa Joan Hart explains all that she's learned along the way-what's kept her grounded, normal and working when others have not been so fortunate-and that she's the approachable, hilarious girl-next-door her fans have always thought she'd be.